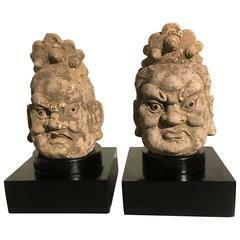 A wonderful pair of Sancai glazed terracotta tomb attendee figures. These colors of green and cream add depth and class to any decor and are very charming as an extra bonus. 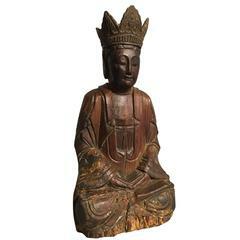 Ming Dynasty (1368-1644 AD) Height: 16.25 inches (42 cm) Diameter: 4.75 inches (12 cm) Condition is excellent with wear commensurate of age and use. Light chipping and 1 repaired head. 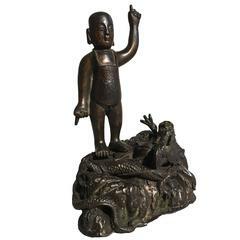 Ming statuette art reflects the attempt to restore purely “Chinese” artistic genres with a healthy injection of Confucian aesthetic, political, and moral standards. Realistic depictions of daily life became popular themes among artists who were often patronized by the court. Under Xuande’s reign (1426-35), the art industry flourished, producing many exquisite porcelain and ceramic pieces. This glazed set is a product of the artistic revival that occurred throughout the Ming. This Ming set of glazed figurines depicts an aspect of Chinese political and social life. Tributary processions were common protocol at this time, the emperor requiring Provincial lords to pay tribute and tax on a regular basis. Processions were also held for funerals, marriages, and rituals differing in grandeur depending on the status of the individuals involved and nature of the ceremony.